Hershey's Nuggets are bite-size servings of the famous chocolate. They come in several flavors, including Milk Chocolate, Milk Chocolate With Almonds, Special Dark With Almonds and Milk Chocolate With Toffee and Almonds. You may save some calories by eating the nuggets versus a regular bar, if you can stop at one or two. One serving of Hershey's Nuggets is four pieces. All the flavors, except Milk Chocolate With Almonds, contain 200 calories per serving. The Milk Chocolate With Almonds variety has 180 calories in four pieces. Four Hershey's Nuggets contain 12 to 13 g of fat and 6 to 7 g of saturated fat. They have 20 to 25 g of carbohydrates, 16 to 23 g of sugars and 3 to 4 g of protein. 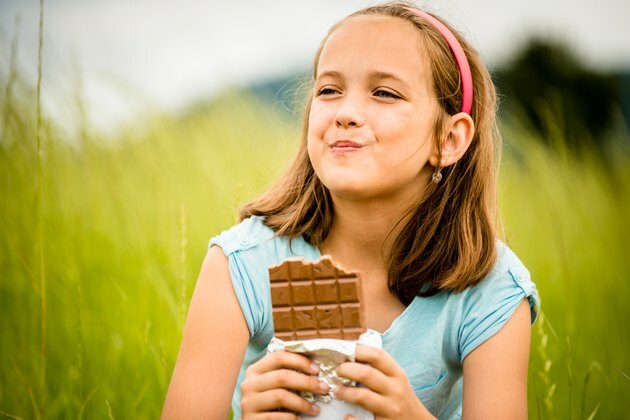 A Hershey's Milk Chocolate bar has 210 calories. One bar equals 1.55 oz. Four Hershey's Nuggets have 180 or 200 calories and equal 1.3 oz. The serving size for Hershey's Nuggets is slightly less than a single Hershey's chocolate bar. The misconception that the nuggets are tiny and insignificant may lead to taking in more calories than you would if you ate an entire bar. Eating more than five nuggets would equal more calories than one chocolate bar.